Eight years ago, I bought a notebook computer "Acer". It was harassed so much that I couldn't went internet with it so I abandoned it. Then my wife had a "specialist" to fix it. The specialist download some program so we could watch Chinese film in iternet. Soon something happened that made me think it was a trap set up by the Feds, I abandoned it again. See #657. Now I use a computer abandoned by my wife's company. My wife has an i'pad used as her communication tool. I often use that i'pad to read news for its quick reaction. Yesterday, my daughter came with an used i'pad. She transferred the information from original one to the new one. That means I can have an i'pad for myself. The long time downloading reminds me of Acer's story. Could it be another trap? The Feds allow me to have i'pad of my own. They must have planted something illegal at that i'pad. What I worried is the Feds have planed a drug case to arrest as many people as possible and try to link me to the case by i'pad. On Dec. 7, I wrote "655. Bin Laden and Julian Assange, False flag and living plant (12/7/2010)". Later that day, I learned that Assange turned himself in to the British police. I think that was a swift reaction to my analysis. When Assange's real face was exposed, it was unnecessary to maintain the puppet show. Anyhow, his mission is done. The Internet censorship law- COICA, will go through the House next month even he is absent. WikiLeaks established in 2007. The high tide is in recent days. Feds finally consume Julian Assange in my case. On 12/4, they set up a link between Assange and I by answering my post with his name. Then when I correctly revealed his role is a false flag on 12/7, they ended his hide and seek game earlier than planned. This time the possible accusation the Feds apply on me might be "access the secret site". I worry that Feds had planted some secret in my computer. I bought a note-book one year ago. I seldom use it because it was heavily harassed by the Feds. The telephone line was blocked; wireless didn't work; even the software Microsoft Word didn't work. Three months ago, my wife suddenly became active on computer with the excuse that she wanted to watch the movie from the Internet. Then came an AT&T technician who found problem in outside station. So the line was opened. Then my wife asked a computer specialist work on my note-book. He downloaded some program into my note-book. So I could go Internet at home and write, store articles with Microsoft Word Pad. Sometime later, I found that new Microsoft office software having strange character. It kept pop up when I didn't use it. Have you ever seen the Word Pad actively invite you to use it? It also started to request my name if I want to use it. I suspect someone was controlling my computer remotely. They might covertly collect my material through spy software downloaded by that specialist or even input some "confidential material" into my computer without my awareness. My wife never watches a movie from the Internet until now. What she did three months ago, was an action instructed by the Feds. They set up a trap in computer for me. I allege. To eliminate my suspicion, the computer specialist my wife invited was S.Y.. He was my neighbor 15 years ago. The three children were at similar age to my daughter. My daughter had had three playmates before 1995, they lived cross street or several buildings away. They were all moved away at that time. Instead, Feds found three new playmates for my daughter. From them, I learned that when Feds put one under surveillance, they even get the child included. (my daughter was 6 then) And how close it was? Two families were in next door. One worked as my wife's colleague. C.Y. was a Chef. He never worked long in any restaurant. Sometimes one week in this one, sometimes a month in that, he changed his employer all the time. When Mrs. Y said her husband had almost worked for every restaurant of the Bay Area, I interpreted it as: the Feds had investigated all restaurants in Bay Area. S.Y. was a boy then. Last time I saw him, he was still a pupil. Now he is a young man. It seems the Feds have cultivated him as a computer "specialist". My wife and I have a joint account in Wells Fargo Bank. About a decade ago, my wife opened a bank account of her own so that joint account was neglected. The account is maintained with certain amount of deposit because there is a safe box under its name. Anyhow, there was statement from bank every month. (see #980, 981, 984). I also found the Feds had planted drug powder in newspaper to justify search and arrest. When they could plant drug trace in newspaper, it's easy to plant powder in letters. Thus I seldom touch those junk mails and utility mails. In later July, my wife reminded me there was a wrongly addressed letter from Home Owners' Association to me. (see "1032. Removal of surveillance car (8/5/2018)") So I started to check the pile of unopened letters. I found Wells Fargo Bank stopped mailing their monthly statement since March. That never happened before. Feds plotted a murder case in March (from 3/14 to 3/30) See "1012. Murder attempt on my wife three days later (3/27/2018)" The Feds used to kill their targets and loot their wealth, I told my wife to check what happened. She went to Wells Fargo on 8/11, Saturday. They said the statements were held because the account was inactive and promised to print some checks for her next week. from a company named "SFE"(Energy California, Inc.) It offers a three years plan program that customer pays a fixed monthly rate on natural gas to avoid tiered pricing. My wife has signed the agreement. I view it as an intimidation from the Feds. A response to our inquiry on bank statements. It's a way to get the signature from the victim so they could loot their wealth by fake document with stolen signature. A dead victim can't verify her signature. I think so because the salesman came on Saturday night. Same day my wife visited Wells Fargo Bank. That "SFE" has no formal address. It is: P.O.BOX 967, BUFFALO, NY 14240-0967. I think it is a company run by the Feds. The main purpose is to get victims' signature. 25 years ago, I had a feeling that the Feds would have murdered me in September. So I quit the business. One month later, I found my worry was very true. The Feds create an event to get my new credit card. Since then I realize the Feds are mob like bands. I had a Visa card. About in September 1993, Visa card company said they would transfer my Visa card into GM Mastercard. I wonder why they did so and thought they might sold business to another company. In Oct. 15, Visa card company gave me a letter, said that as one of select customers, they were sending me a Mastercard to replace Visa card. Usually this was a notice and customers would receive the card in a week or so. I didn't pay much attention on this because at that time, I felt pressure on my business. Newspaper said Mrs. Chen's drug case would be sentenced next week. Berryessa Flea Market announced there would be a Festival next week. There would be music, and free beer. I've been in Berryessa for nearly 10 years. It was the first time experience. Free beer reminded me of free entertainment of Disneyland for FBI agent. It seemed that they would close the drug case and had a celebration. I knew I was much more a target than any real criminals because I knew too much dark side of Federal law enforcement agency. I didn't know what they would do but expected there would be a violent end. So I abandoned my business that week. In Nov. 24, GM Card co. mailed me a letter, reminding me they had sent me the card, and emphasized with bold letter that:" If you have not received your new card(s), please call our Lost/Stolen Dept. at......." The same sentence was put in an eye-catching box at the top of the letter. I called that number. Staff said they would cancel the lost card and mail me new one. Right next day, I received the letter contained new Mastercard. "What an efficiency!" I admired while calling Card company to confirm of receipt. To my surprise, I was interrogated by the staff for sometime. Then they told me the card number I confirmed was reported lost yesterday and should be the card due in my hands one month ago. I immediately realized someone surveying on my mail had held the credit card. They only released it when touched off by report lost phone call. That's why I got the lost mail next day to the phone call. The promised new card arrived nine days later. Since then I was aware they even developed a system to steal from people. Everything was well planed in advance, they even could get a credit card of full amount from victim which the dead man could never verify. It may also explain why they are so easily kill innocent people: they can always 'profit' from it, either by credit card, cash or their collections. And it is the safest loot, no one will complain. All victims are dead people. Because the Feds (FBI, DEA)try to frame me in drug case, I had to take basin bath and avoiding trash garbage. I used to burn the yard trash. This summer several wildfires the largest in California history burned the state for nearly two months. Cal Fire pushed back its estimate for containment by two weeks for the massive blaze, which is made up of the adjacent River and Ranch fires. Officials had previously anticipated full containment by Aug. 15, but now say it will be Sept. 1. I have a feeling such a long lasting wildfires were the work of the Feds. The purpose is to find a reason to stop me from burning withered leaves. On August 30, when the fire were reported contained, I burned some withered grass. Two days later-Labor Day, I heard some noise at front yard. It was my neighbor - Mr.Wu. I rarely saw him, perhaps once a year. He was trimming plant in his flower bed. There was not much trash, but he made a noise. he put the yard trash on street. I think the Feds called him here to do a guide work. They hope me to do same thing instead of burning the trash. I didn't follow. Then New California wildfires Prompts Mandatory Evacuations. Will they keep the fire continue to burn till the end of September? I think the Feds is framing a case of "finding drug trace in yard trash" on me. I also noticed the news about Hurricane Florence. The extraordinary propaganda on this Hurricane caught my eyes. It reminds me of Hurricane Katrina 13 years ago. I think Hurricane Florance could be prepared as a distract on my case. They could have developed it to a bigger disaster if I burned off leaves again. Here is what I wrote 13 years ago. It describes how the Feds set up traps in my case with climate war technique. (1) H.A. mailed me a letter, required a clean up of garden. Coincidentally San Jose City offered a free dumping on 9/24. Later I knew 9/24 was the landing date of Hurricane Rita. So 9/24 was their action date. Hurricane Rita played as a distract. (2) My relatives (sisters and brother) were arranged a trip in East Coast. (9/10 to 9/17) Hurricane Ophelia went parallel along the Coast at that time. The Feds intended to eliminate my family members by arranged trips. "Enclosed you will find new procedures adopted by the Northvale Board of Directors for Dispute Resolution and Architectural Alterations....."
It announced new "Minimum landscaping requirements" which covers "All grounds visible to the public" and "Enclosed yards". It means now they will interfere the privacy of the backyards. Of course, it came with intimidation: "Effective 60 days from the date of this letter (November 1, 2005), the Board of Directors will strictly enforce these guidelines. Owners found in violation will be subject to fines up to $50 per day until the Board of Directors is notified in writing that the violation has been corrected. In addition, the City of San Jose Code Enforcement Division may be notified in order to assist the Association in bringing a property into compliance." Three years ago, H.A. had played same trick on me. I had called that man Brad Fox several times and even wrote a certified letter to him, but never got a reply. (see "95. A notice for a meeting") Now when Feds exhausted everything, they create new procedure and requirement to persecute. I view that PML Management Corporation as a support group work for the Feds. Why on 9/24? Because I don't dump the rubbish. I am afraid Feds will plant in garbage to frame a case. It used to be done by my wife. A notice from H.A. forced a new requirement to clean the back yard before 11/1. City offers a free dumping in time on 9/24. I don't think it was a coincidence. Feds arranged me to do the dumping work on 9/24. I believe they plan a framed case on that day. I allege the recent hurricanes were practice of climate war. It was part of framed case plotted by D.O.J..
(1) To distract the peace movement, New Orleans was drowned by flood caused by Katrina on 8/29. The tragic scene thereafter occupied the whole page and screen of media for weeks which at same time drowned the news of Cindy Sheehan's anti war bus trip that started one day later. The national emergency rescue was deliberately delayed. Military waited three days for orders. The slow re-action is not only incompetent but a crime when a city was drowned. But this was what inside group needed. The delay of rescue could create more stories of death, loot to draw public's attention. The media even activated an accusation war of who should be responsible for the slow action All these aimed at one purpose, to divert public's attention from peace movement. Of course for the big demonstration of 9/24, Inside Group prepared a big hurricane. Media blew the trumpet to propaganda that Hurricane Rita was shaping up to be one of the strongest Storms ever to hit the USA, exceeding even Katrina. And the landing date of Rita was exactly the same day - 9/24. As a project to distract, hurricane Katrina and Rita was a success. There is little report about anti-war gathering. They checked up the momentum of Peace movement at the loss of thousand lives and hundred billions worth of properties. (2) To cover up the framed case, Katrina also played an important role. My case is a big one. Feds has accumulated large quantity of real estates property in the case. To keep the value of these properties, they abuse the power to keep the long term interest rate low. Feds creates a strange phenomenon: all other merchandise were in low price which include automobile, computer, food, clothes .... except the house. To maintain a booming real estate market, they almost make the long term interest rate equal to the short term one. But all these are artificial. Once I was eliminated and they released their properties, all the restriction on other merchandise will be released too. There will be a big inflation in US then. Long term interest rate will go sky rocket. For this economic crisis, Inside Group even prepared to squeeze more from American people. They passed a new bankruptcy law for those potential victims of the coming economic tsunami. And Feds also prepared a justification for that crisis. When despaired people get angry, government will attribute the failure to the hurricanes. It damaged oil industry in the Gulf of Mexico and caused high gas price. Everybody will believe so because they feel the bite when they pump the gas. The real cause of the crisis will be neglected. Hurricanes would be the excuse of an economy depression if the 9/24 frame case has been carried out. Ophelia was another storm developed around 9/10 in East Coast. The newspaper said "It loitered in the Atlantic for days, and is trudging so slowly that it should spend two days on North Carolina. ", "It's been very difficult to get a feeling of what Ophelia is going to do." The strange thing is here. For Rita and Katrina, the media seemed knew what they were going to do and even draw a timing route for their future movement. Why they couldn't tell Ophelia's? I know why. Ophelia was a work of operation team of climate war. The team worked it out after they finished Katrina and then after Ophelia, they went for Rita. The task for Ophelia was to distract, (or even play a role) in a trip accident. My relatives were then in a trip in East Coast and Canada. (From 9/10 to 9/17). On 9/2 and 9/7, I continued to warn that Feds would create a travel accident to eliminate my family members. (#339, #340). To justify it, they even produced several air crash within a month. 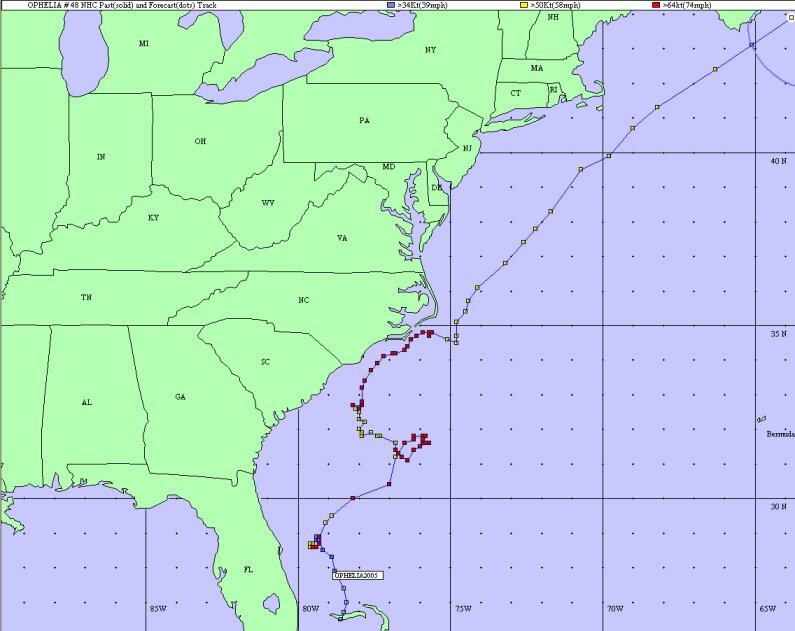 Ophelia wandered along East Coast, it was waiting for the decision of Feds. Its movement puzzled FEMA team. Feds had planned the Rita even stronger than Katrina. They even put the landing date on 9/24 the action date. But it was too evident a plot after my revelation. When in final days, news changed the tones said that Rita wouldn't develop to category 5, I knew the 9/24 frame case and bombing plot went sour. In Hurricane Katrina event, the Feds planed to eliminate me, my wife and my siblings. (1) 9/10 to 9/17/2005, My brother and two of my sisters were arranged a trip in East Coast. At same time Hurricane Ophelia went along East coast, ready to raid the land any time. Watch the odd path of Ophelia. This was chart on 9/14, it never landed since the case was soured. (2) I was intimidated by the Home Owner Association to clean the yard in September. Just then San Jose City offered a free dumping on 9/24/2005. It was a typical framing case of planting illegal trace in garbage. 9/24 was the landing date of Hurricane Rita. Media once predicted it would be bigger than Katrina. If the Feds had framed me in dumping case, then Rita would have played a big disaster to distract. (3) 9/22 to 9/29/2005, My wife was arranged a South-east Asia trip. She almost encountered a Typhoon on 9/27. Back to 9/24 framed case. In "#342. Homeowner Association again (9/12/05)" I talked about How Feds arranged a trip for my wife between 9/22 to 9/29 so they could frame me in a special "9/24 Neighborhood Cleanup day". Then what would happen to my wife while she was in South east Asia? They prepared a trip accident. My wife told me a lucky story when she returned. The travel group would tour Haloon Bay in Vietnam on 9/27. Some big boss in the group gave up the tour with the excuse they must attend a meeting or just plainly said they were afraid of the typhoon. Only a few tourists went with my wife. But the typhoon miraculously left the Haloon Bay a day before so they had a nice boat tour. On 9/30/05, there was a picture in Mercury News which shows a woman walking through rubble caused by Typhoon Damrey. "The worst storm to hit Vietnam in a decade. Officials said Thursday they had recovered 38 bodies so far." I think there would be a "boat accident caused by typhoon" on 9/27 if the 9/24 framed case went on successfully. The good luck for my wife was not a nice trip but a safe one. In last two messages,(1039, 1040) I talked about how the Feds plotted a murder case in 2005 Hurricane Katrina event. They planed tour for my wife and my siblings. Because it's easy to create accident death or frame a case at people when they were in traveling. As for me, manipulating the Home Owner's Association and City of San Jose, they organized a free dumping garbage day, to arrest me by claiming they found drug trace in garbage. This October their plan is almost similar to 2005 case. They planed tour for my wife and my sisters. My wife will go for a tour to Dubai and Egypt from 10/14 to 10/28. Two of my sisters will go for a tour in China in October almost at same time. In #1041, I talked about October plot how the Feds arranged to murder my wife, mysisters and me. Then there come two odd news. In early July, US quietly made some concession to China. I think that is the payment for a framed case. See "1030. Payment of a secret deal". It also accordant to my allegation that the Feds would do a mass slaughter to eliminate my family and relatives and people who know the story. My wife has a lot of relatives in Philippines. It seems they will be murdered too. Philippines is a country under the control of the Feds. (I'll talk about it later). When the Feds(FBI and DEA) rigged the 2016 election to have their candidate Trump to grab the president power, they also have their agent Duterte to grab the power of Philippines president. Duterte is known as "Philippines' Trump" who rules Philippines ruthlessly and killed a lot of people in the name of "drug war". The following two assassinations took place in early July, synchronized with the early July plot. The purpose is to justify a big slaughter by government in the name of "revenge for the dead Mayors". I think. 16 years ago, Bush was escorted to the president seat by the Feds. The big event was 9/11 attack. The secret deal was between Chinese secret police and the Feds. (FBI and DEA) In deal, China was to smuggle drugs to US to frame a case on Kat Sung. The payment was to hosting 2008 Olypic Game and the membership of WTO. This month, they escorted Trump to the president seat. A new secret deal has been made. It still is to create a drug case, but the victims will be much more. My relatives and other people who know my story will be killed in this created case. My wife is arranged a trip to China and Philippines from 11/13 to 11/21. The Feds used to frame a case when victims are in travel. The drug case will take place in these two countries and in US too. The case will be operated under the name of Interpol. For this purpose, a Chinese police officer has been selected president of Interpol. Nusa Dua (Indonesia) (AFP) - A Chinese security official was elected president of Interpol Thursday for the first time, sparking criticism from activists who say Beijing uses the agency to track down dissidents abroad. US intelligence infiltrates all kinds of organizations. 16 years ago, they satisfied Chinese demand by the approval of the commission of Olympic Game and the WTO. This time, for the same purpose, they sent a Chinese police officer to the seat of Interpol president. In early September, the web site were full of news that there would be a last battle in Idlib to unify Syria. Then came a news that Russia and Syria stop the assault in Idlib and create a demilitarized zone there. The Chinese sites all say that the assault will re-start on Oct 15. (CNN)Russia and Turkey have agreed to create a demilitarized zone in Syria's Idlib province, potentially thwarting a large-scale military operation and impending humanitarian disaster in the country's last rebel stronghold. ...... The zone, which will be patrolled by Turkish and Russian military units, will become operational from October 15. That's the time when my wife told me she would go for a Mid-East tour on Oct.14. It seems the Feds delayed a battle for a murder case. My wife will go to an area with battle field. For decades, I don't believe coincidence anymore. Kat Sung and his family are the murder targets of the Feds. (see last message #1042) The major players of Syria war are Russia and Turkey. Behind them is US. In #1041, I wrote that the Feds have made a plot in October. They arranged tours for my sisters and my wife. My wife's Mid East tour is from 10/14 to 10/28. A utility company purposefully shut off electricity to nearly 60,000 Northern California customers Sunday night, aiming to reduce wildfire risks from power lines during extreme winds. It means California is in so dangerous situation that even PG&E shut off the power supply to 60,000 customers in advance to prevent a fire risk. My view is it proves my predict that the Feds created a case to frame me and my family in. The "Sunday night" was Oct.14 night. The time my wife left for her Mid-east tour. On October 24 in night news of TV, I saw there was a big fire in Oakland that burned 126 units in construction. I am alert of fire because the Feds try to justify an arrest if I burn the yard trash. October weather is cool down, but they still create a situation that fire is dangerous. On 10/14, they let PG&E shut off electricity in name of "prevent fire". (see #1044) I think this fire is part of their plot too. I allege the Feds target at big housing construction sites because new houses are threaten to the house price. The Feds rely on the money they made from rising house price in my case. That construction site once had been their target. This time they revive it again because in October plot, they need a big fire. The massive, unfinished residential complex that went up in flames Tuesday in West Oakland was targeted by an arsonist six months prior in a smaller fire intentionally set in a stairwell of the development, a city Fire Department official told The Chronicle on Wednesday. I am innocent. To eliminate an innocent man by framing him in criminal case takes a lot of money. The Feds(FBI and DEA) used to get the money from real estate business. They paid 10% down payment,that's 30k. Then in 2007 when the house price went up to 680k, they could get 380k cash by refinancing. Now it's 1.61 million, they could get another 930k from it. 30k for 1.31 million, what a profit. Any time when the case is over, they leave the debt for bank to take care. 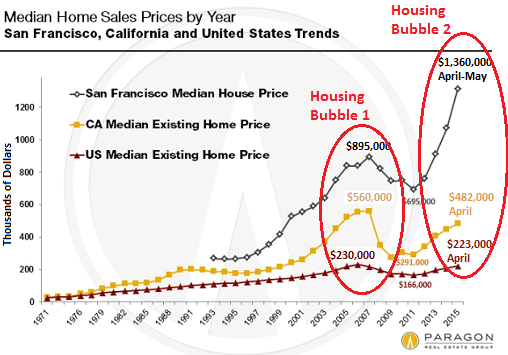 The point is to keep the housing market hot while the case is alive. To keep the balloon from popping off, they keep the interest as low as possible. Now the media house price of St. Francisco is 1.61 million. That's where my sisters live. San Jose's is higher, that's where I live. Lupus is a disease Feds used to kill female victims. Feds once tried to use it to murder my wife in September plot(2017). (see #978,979,980) I revealed it on 9/12/2017. For this October(2018) plot, the Feds pre-warned on 10/7. In TV KTSF26 night program at 9:30, there was a lecture about Lupus. I think that's an intimidation. I have warned Korea war crisis would be created to cover up the framed case of 9/2. N.Korea did detonate a nuke bomb on 9/3. If US reacted with "fire and fury" Trump had promised, my predict would have become true. The procedure was so closely carried out. Only the Feds failed to frame me in any framed case. Then the Feds immediately designed another murder case - to kill my wife. The Feds used to influence public opinion by TV commercial. on 9/6 and 9/7, an organization had an ad on KTSF26(Chinese) to remind people of "Lupus erythematosus". It was so short lived(2 days) that I never saw it after 9/7. What I remember of that ad was some people having a parade with banners written "Lupus ..."I even couldn't finish reading the whole banner because the banner was upright, the English was so rare seen. I was confused the first letter was "I" or "L". I knew it was "lupus erythematosus" only by audio Chinese aside. Decades ago when I was a in HongKong, I knew an acquaintance of my parents - Mrs. Wang. Mrs. Wang was a rich widow. She lived with a close friend - Ms. C. Mrs. Wang had a quick death - died of Lupus erythematosus. Although people knew she had such a disease, nobody expected she'd have a sudden death. The gossip in their social circle was: how much did Ms. C got from Wang's wealth. In US, when I knew G-man and realized he is a double agent, I also knew Ms.C is G-man's sister. I also found the Feds are money looters. That made Mrs. Wang's death a thoroughly different story to me. Lupus erythemotosus could be a killing tool of the intelligence. I don't think the short lived commercial of Lupus Erythematosus is a coincidence. The disease is incurable and victims mostly are women. In #979. I wrote," If I were arrested when my wife was absent, nobody would have known that I was in prison. This time my wife travels to Canada from 9/2 to 9/9. The Feds could have seven days to do a "suicide" death." The words might touch off the killing motive. If my wife doesn't exist, that's more convenient for them to do a murder case. N. California’s Paradise fire becomes one of state’s worst: 6,700 structures lost; at least 9 dead"
Several days ago, I found a post that proves all these disasters were caused by man made climate war. Pt. 2; 11-4-2018; Heavy Aerosol Chemtrail Spraying Prevents Rain Despite Jet Stream Moisture Flow! (Sun.) Pt.2; The Watervapor and IR maps show substantial moisture flowing through California and Nevada on the Jet Stream, yet there is ZERO precipitation showing up on the Doppler map! The reason no rain is falling is becuase of the massive chemtrail aerosol spraying high above the incoming moisture to 'cap' the atmosphere! Since there is an official no-rain forecast in Southern CA for the next 10 days, we see the specially equipped jets spraying the chemtrail aerosols to stop the atmospheric lift necessary for the precipitation process. The Feds spread chemical to change the area's air pressure to force the humid air mass away from California, that has made California a dried land for year long. ZERO rain in California. Yet jet stream flows over state. The weather terrorists continue to spray dessicants over the moisture field yet again to prevent cohesion and lift of the huge moisture field moving from the Pacific Ocean over California. This is the pattern so far this monsoon season that usually begins in late September and October. The aerosols and EMF weather machines such as NEXRAD and SBX-1 are I full deployment to continue to dry out and destroy California. No rain anywhere here. 14 years ago, I talked about how the Feds changed the climate by chemtrail. In many web sites, there is a common topic: "chemtrail". People puzzled what is it for. They worried the chemistry will hurt human's health and pollute the nature. Here is a typical post about chemtrail in a discussion. Quote, "Chemtrail, the name given to non-dissipating vapor-like trails left in our skies in grid like patterns by high altitude, unmarked aircraft. People all over the world have now witnessed these, and they've been so concerned that they have contacted their governmental representatives. Dennis Kucinich has included this phenomenon as part of his protest statements against U.S. space weapon development. Other senators have been involved, too. Control climate generally means control the movement of air stream. By controlling area air pressure or temperature, people can build artificial air passage or air wall, (of course, invisible, but sometimes people saw the chemtrail in the sky) guide the air mass move to area they want. Either it is cold air mass, or warm air mass, or humid or dry air mass. A hurricane needs a warm air mass with rich water vapor. Ocean supplies it. A hurricane also needs big air pressure difference and temperature difference above it. This chemical supplies it. That's how an artificial hurricane developed. Fearing the Feds to make arrest by claiming they found drug trace in garbage, I used to burn the withered leaves. I think the Feds created wildfires to justify an arrest. Last month (October) I wrote #1044, alleged the Feds would justify search and arrest by wildfire on 10/14. That day, PG&E strangely shut down the power supply to part of North California. I particularly noticed it because the Feds used to create big event on action day. 10/14 was the leaving date of my wife's Mid-east travel. Feds used to make arrest at check point at air terminal when they can legally search passengers. A recent news indicates they had prepared Paradise fire as early as in October. On Oct. 14, the company cautiously shut off power to some 60,000 Sierra foothills and North Bay customers, hoping to prevent any downed power lines from sparking a fire. On Nov. 6, PG&E again began warning 70,000 customers — including those in the town of Paradise — that it might flip the switch in the face of fire danger. Here is a picture of Paradise after the fire. You can see Houses were burned into ashes, But trees remain green. By common sense, was it possible? To burn a house to the ground usual takes hours or days, that will affect nearby trees. Unless the houses were made by papers, (then they would have been burned in seconds or minutes). The picture shows a "fire" flashed through the town that only destroyed houses but left trees alone. I think the Feds were behind this tragedy. They planned this for a long time. To create a dry weather (see #1047 to 1049) and select Paradise as victim (see #1044). They finally carried it out on November 8 because it is rain season. They had made California a "no rain" land for too long time and wouldn't abandon it for doing nothing. To wipe out the witnesses, all town were ruined. The time was at 6:30 when people were asleep. To justify the high death rate they said the fire grew at about 80 football fields per minute. Since they controlled the media, I think people will never know how many people died. I was harassed to post in Internet. The processing become very, very slow. And frequently the computer lost connection to Internet. I think the problem is what I said in #1050 was very true that "To wipe out the witnesses, all town were ruined. The time was at 6:30 when people were asleep. To justify the high death rate they said the fire grew at about 80 football fields per minute. Since they controlled the media, I think people will never know how many people died." I now allege the Feds planed a fire to eliminate me. The fire would be done by DEW (Direct Energy Weapon) It's quick and controllable. It's evident that the targeted houses and automobiles were burned severely while nearby trees were in much better conditions. Nobody in video said they saw fire at about 80 football fields per minute. With that speed and high temperature (that even melted aluminium wheels of the car), the surrounding trees wouldn't survive. It could be done only by high tech. weapon. I could hardly post in internet sites. I think the Feds have prepared a raid anytime recently. On December 12 near 2 o,clock, an Asian lady who wore a glass walked into the lane. She paced up and down and watched at my house for a while, then left. Soon, there came a car. Parked at the entrance of the lane, headed to my house. I was familiar to this deep grey car- a surveillance car of the Feds, often parks at same place to intimidate. I even talked about it at # "993. Thanks Giving day plot (11/29/2017)" (While I was alone after supper, I went to computer. The window faces the entrance of the lane. Sitting before the computer, I was alarmed by sharp light from window. It was from a car parking at lane, The lane was narrow. Rarely people would park their car on passage, let alone to ejecting light on other's window. Obviously it was an intimidation. "We are watching you." or "We come to arrest you". It was a provocation.) What was it going to do this time? Then that Asian lady appeared again and repeated what she had done before - paced up and down and watched at my house then left. The surveillance car left after that lady's leaving. A few minutes later, a "DHL" business van parked at cross street. That Asian lady appeared again to shake hands with the "DHS" driver. The performance was done at the entrance of the lane. This was not the first time I saw that lady. Sometime ago, she was with another lady at the entrance of the lane. Then in early October, I received a letter of AT&T which said AT&T "proposes to install equipment on street pole." At that time I allege it was a surveillance program of the Feds. That lady obviously is the living plant (as an illegal target) used by the Feds to apply for a search warrant. The coming of deep grey car was to take a picture with which they could apply for a warrant to extend surveillance to my house. That lady, of course, would follow the order from the Feds to repeat similar action twice before my house. Senators passed the measure, which would keep government running to Feb. 8, by voice vote without a roll call. I view it as a Feds oriented plot. Feb.5/2019 is Chinese New Years Day. My family members used to gather together to celebrate it. Feds also used to chose such date to carry on a raid. Why do they relate it to a government shutdown? Because that is a framed case, the Feds will kill many people because they are innocent. Some law enforcement officers and correctional officers may not be there to do the bail work. That's why the Feds used to frame a case on Friday, the jail won't do bail on week end. A shut down gives the Feds more time to commit murder while innocents are in custody. What surprises me is this morning's news(12/22) says Trump refusing to sign the budget because it doesn't include the fund to build a wall to the US-Mexico border. The abrupt action of Trump indicates how eagerly the Feds is to finish my case.They even can't wait to February - their original plan date. Today is 12/22. My family members have a dinner party for Christmas. I think that is the recent target of the Feds. One thing I'd like to remind people, the Feds used to activate big event to distract a big case. The distract case will be bigger than North California wild fire(Paradise fire) or Las Vegas mass shooting. And mass murder will take place. On Aug. 3/2017, a PG&E worker came to my house and replaced the gas meter. I was afraid of a gas explosion and called the company. See "974. Prepare for a gas leaking (8/9/2017)" Two months later, I found the Feds had prepared a mass shooting case between 8/3/17 to 8/6. A plot two months later: My wife was arranged a tour to Europe on 10/2/2017. Two hours before her leaving, there was a mass shooting happened in Las Vegas. The Feds used to arrange travel for my wife so it's easy to create accident death on her. The mass shooting was used to distract the murder plot on my case. Then the news reported Las Vegas shooter Paddock also prepared a shooting case on 8/3 in Chicago. booked one room at the Blackstone Hotel in Chicago, which he was due to check into on August 1, and he booked a second room for check in on August 3, a law enforcement official told USA Today. Both rooms had a checkout date of August 6. The Lollapalooza music festival ran August 2-5 and takes place in Grant Park. In October plot 2018, My wife was arranged a Mid-east tour on 10/14/2018. Same time PG&E cut power supply to North California area. I think it was unusual and wrote "1044. Shut off power supply to "prevent" fire (10/20/2018)"
Three weeks later Paradise fire took place. It was the biggest fire in California history and would play a big distraction. Do you see the similarity? 1. PG&E involved. 2. My wife was a murder target. Travel arranged because accident are easy to create. 3. Big events created to distract. 4. I wrote my suspicion in advance and was later proved by news report. 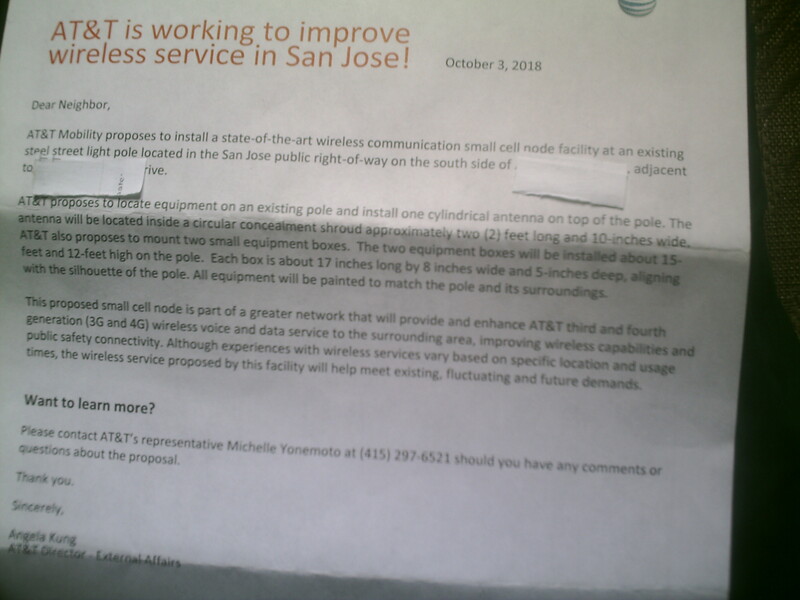 On 10/3/2018, I received a letter from AT&T said that they "to locate equipment on an existing pole and install one cylindrical antenna on top of the pole." to improve wireless service. There was a street map of the pole with the letter that just overview the entrance of my lane. That's a warning the Feds formally put me under surveillance. Although the whole community are occupied by the Feds and their support groups, their surveillance are unreasonable, but now it becomes formal. That's when they sent an Asian lady playing a stageshow at my house. See "1052. How the Feds frame a case (12/15/2018)". She must have played an *illegal target" to justify a surveillance warrant" on her but the real target is "me". After I posted #1052 on 12/15, something dramatically happened. From 12/16, B house neighbor started to move out.See map of my lane at "#1032. Removal of surveillance car (8/5/2018)" Another family moved in. At that time, that Asian lady occasionally appeared. It means now the Feds formaly move in their "illegal target" so they can formaly monitor the lane I live. This is how the Feds to turn innocent people under their surveillance by "living plant". Corrupt officials plant fake evidence at your home. Then apply a warrant Say they suspect you are a criminal. They get a warrant then found the "evidence"(gun, drug) at your home. That's how the 4th Amendment bypassed. Jan. 1st. was New Year's day. New moved in family in B house had a busy day to move in their stuff. Though they should be disguised as "criminal target", they are part of surveillance team in fact. They must live in nearby area or just in same community. I noticed that sometimes the interval of empty car bring in new stuff took just a short-while. Among them there was a typical "S.S.G." - three teen age girls. To my experience, the Feds used to organize three people as a "special support group". This S.S.G. had two dogs. One was a big dog like a grey wolf which pounced from time to time. One year ago, San Francisco mayor Ed Lee was dead of "heart attack". I wrote #995, alleged it was part of murder plot. Now the Feds are planing a framed case in San Jose and they play that trick again? San Francisco Mayor Ed Lee died suddenly today. San Francisco Mayor Ed Lee’s death early Tuesday morning after suffering an apparent heart attack echoes a family history of heart disease. Coronary heart disease accounts for 1 in 7 deaths in America, killing more than 360,000 people a year. The average age at the first heart attack is 65.3 years for males and 71.8 years for females. Lee, who suffered a heart attack while shopping for groceries Monday night, was 65. Recently the Feds intensify their framed case on my family members and me. I think they planed an arrest on Thanks Giving Day family party. see "993. Thanks Giving day plot (11/29/2017)" The party place is my sister's house in San Francisco. My relatives used to meet there on holidays. To perform a big arrest, s.F.P.D. would involve in. Since it's a framed case, and a big one, they just eliminate every element of obstruction. Ed Lee obviously does not belong to that criminal group. This is holiday season: Christmas Day, New Year's day are coming. So the Feds are working relentlessly for it. The heart attack is a skilled murder weapon for the Feds.